Photo courtesy of the Wichita State Shockers and ksn.com. With today's win, the Wichita State Shockers have claimed their third straight Missouri Valley Conference regular season title. TERRE HAUTE, INDIANA---Arguably playing for their at-large lives, the Wichita State Shockers had a nationally televised must-win matchup with the struggling Indiana State Sycamores Sunday afternoon. And they had no trouble continuing to cause their opponent to slide down the Missouri Valley Conference standings as Gregg Marshall's group won their thirteenth MVC game by double-figures in a 84-51 rout of the Sycamores. Surprisingly competitive and close for the first four minutes, the Shockers' "star senior" duo of Ron Baker and Fred VanVleet found themselves in a 2-on-2 battle early, for the Sycamores' Brenton Scott and Devote Brown had the score even at seven. However, Wichita State did pull away thanks to the bench play of MVC Freshman of the Year candidate Markis McDuffie and fifth-year senior Anton Grady. The two were instrumental following the first media timeout as they supplied a total of 11 points on 4-of-5 shooting in a 15-4 spurt (22-11 WICH). Later Wichita State big man Shaq Morris flexed his muscles with 7 of his 11 points in a three minute span, which in turn molded the advantage to 15. Additionally, Baker re-found his range to produce five unanswered at the 3:48 mark. 39-21 Shockers! Although Everett Clemons single-handedly paced the Trees by fighting the hungry opponent to an even final three minutes (44-26 WICH), Wichita State sent the home crowd to the exits on their first possession of the second twenty minutes. Shaq Morris set a screen at the top of the key, Fred VanVleet dribbled off and lobbed a perfect pass that landed in the hands of the previous before being thrust through the rim with authority (46-26 WICH). That's how! From the aforementioned dunk, this one became all but over. The Shockers continued to get anything they wanted on offense while controlling the game at the other end of the floor as well. In fact, Indiana State's deficit would be pushed to a game-high 33 on a filthy dunk by sophomore Zach Brown (70-37 WICH) before all starters were pulled on both sides. 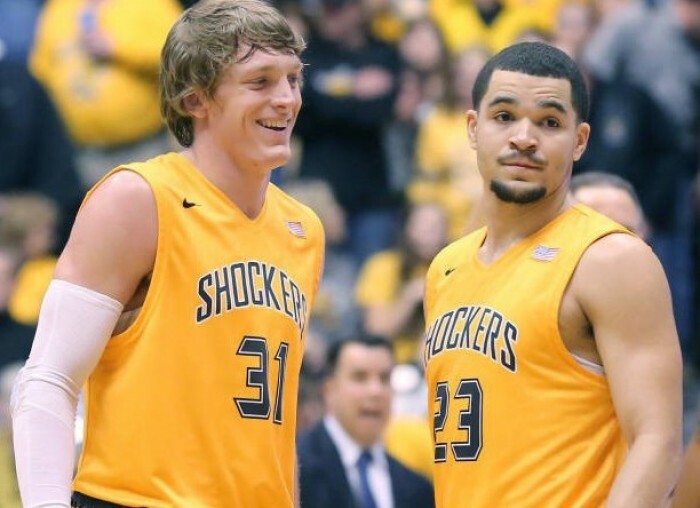 Ron Baker had a game-high 14 points on 5-for-11 shooting in addition to 5 rebounds while Fred VanVleet, his partner-in-crime, had 9 points and 8 rebounds. This has not be an ideal campaign for the Wichita State Shockers. In fact, it has been anything but. From a quick loss to Tulsa to a horrific three games at the Advocare Invitational in beautiful Orlando, Florida, (USC, Alabama, Iowa) Fred VanVleet and Ron Baker's senior year has been turbulent. Nonetheless, they clinched the top seed at "Arch Madness" and their third straight regular season conference championship for a third season in a row with today's dominant victory. Well, although stats like shooting percentage and the rebounding battle would not indicate such dominance, the fluidity of the Shockers' offense and their defense's tenacity was on a level some teams only hope to reach. Furthermore, 20 assists was two away from a season-high. And then there is the winning margin of 33 points. 33! Yet, this isn't even the largest of the season as Wichita State dismantled Bradley by 34 earlier. The 21-7 (14-2) Wichita State Shockers travel to Chicago for a meeting with Loyola (IL) on Wednesday before hosting Illinois State in a revenge game. Because of Wichita State's "star seniors." the non-knowledgeable college basketball fan would assume the Shockers would fail to post the fantastic records of seasons' past next year. But, after today, who says they won't! While the star seniors did their part this afternoon, sophomores Shaq Morris, Zach Brown, Conner Frankamp, and "fab freshman" Markis McDuffie were the difference. As hinted, McDuffie was a catalyst inside the Hulman Center, for he started the first major run of the contest. Additionally, the former ESPN 100 high school prospect netted 11 points. Not to be out done though, older teammates Zach Brown and Shaq Morris also posted 11 respectively while the latter soared for four rebounds. And who can forget Conner Frankamp? The Kansas transfer continued to score the basketball as he finished with 9 points on 3-for-6 shooting. All in all, the future in Wichita is still very, very bright. "We want Wichita! We want Wichita!" 5 weeks ago, the Indiana State Sycamores had just beaten the Northern Iowa Panthers to advance to 4-1 in conference play, and were on to cold Wichita, Kansas, for a showdown with the Shockers. They weren't ready then, and they were not today as well. Granted, one could sense a slump ensuing after anemic shooting performances at home against Missouri State and Drake, but five straight losses, two of which were 28 plus point debacles was unexpected. "We are a little bit of a shell of a basketball team." During the losing streak, the Sycamores have been held to an average of 64.4 points per game (almost 16 points less than the first ten conference game average) while what was thought to be one of best backcourts in "The Valley" was held to 27 points today (Brenton Scott had 14, Devonte Brown with 11, and Khristian Smith ended with 2). Additionally, Indiana State totaled single-digit assists for their seventh time this season (now 1-6 with such a stat). The 13-15 (7-9) Indiana State Sycamores face Northern Iowa in Cedar Falls on Wednesday before finishing up the regular season with Bradley. "Markis (McDuffie) was tremendous in his minutes" said Wichita State head coach Gregg Marshall. "Markis was really good. He made a three, got to the foul line a couple of times. And Anton Grady was able to score mid-range. about 15, 17 feet and was really good for two to three baskets. So we don't have drop off when we go to those guys." "Shaq (Morris) has been playing really good basketball. Fred (VanVleet) usually finds him on his rolls to the basket. And he was able to score with his mid-range jumper. (He) made some free throws. His defense was really good. He builds--we call it--the 'Great Wall of Shaq' and he just puts his hands up and people run right into him." ---Gregg Marshall on Shaq Morris' play. "We just have to worry about the regular season first. We are three games post-Northern Iowa loss at home, and we set a goal at that point to try win the rest of them and get ourselves in a position to get an at-large bid. St. Louis is the next phase, but we are not worried about St. Louis at this point." ---Gregg Marshall on what's next for the Wichita State Shockers now that they have clinched the Missouri Valley Conference regular season championship. "We are not together on the floor." ---Indiana State Sycamores head coach Greg Lansing. "When I took this over (as head coach at Indiana State), I said that 'we were not going to be talking about playing on Thursdays.' And that is what we are staring at." ---Greg Lansing on his team in a three-horse race to avoid playing on Day 1 at Arch Madness. "First off, it is embarrassing. I feel as though we need to start playing for each other. When we come out, we got to lay it out there" mentioned Indiana State guard Everett Clemons (7 points, 3 rebounds, and 2 assists) about today's game. "It comes down to St. Louis at this point." "We still have two games left. We still have March. The season is not over. I have seen crazier things happen."